Professionals and drone enthusiasts can count on Peli™ Products, the global leader in the design and manufacture of high-performance protective case solutions, as the reliable partner for protecting their fragile drones, multirotor systems and unmanned aircraft systems. With over 500 transport solutions for the extreme protection and safe handling of drones and UAV systems, Peli has the right choice for everyone, with a wide range of sizes, shapes and internal configurations that fit almost every need. a drone, that’s why more brands offer the possibility to carry it around in normal backpacks. However, drones remain fragile devices and thus need extreme protection like Peli’s. With sizes for virtually each of the trendiest drones of the year, a Peli Case is the solution for transporting drones easily and with complete confidence: the device will arrive intact and fully operational anywhere across the globe. With a wide range of different sizes, Peli Cases are impact-resistant, watertight and dustproof which guarantee the security of your equipment even under extreme conditions. Some models come with an extendable handle and rugged wheels so you can easily carry your drone everywhere: portability will never be a problem! Even more, travel lighter with the new Peli Air range -the lightest protective cases on the market, up to 40% lighter- which is now available in brand-new colors (yellow, orange, grey and black) and also different sizes! The ZeroTech Dobby S* is so small (13,5 x 14,5 x 3,6 cm) that you can hold it in your hand. 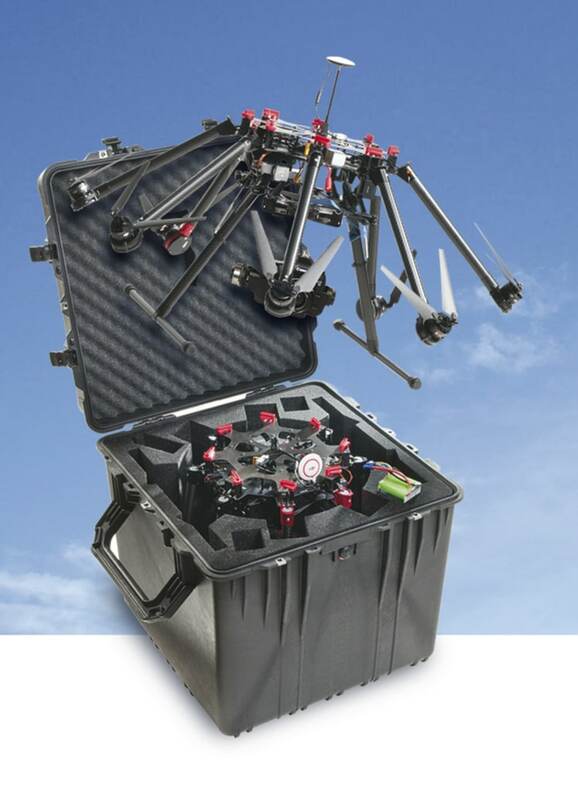 However, to protect so delicate device, the new Peli Air 1535 case is the perfect choice as it can accommodate your drone in landing position and there is even room left for the extra batteries and accessories. And if you prefer to travel even lighter, the brand-new Storm case iM2275 (Interior measurements: 35.9 x 33.5 x 25.1 cm) is perfect to carry your drone in travel mode as it offers more vertical space thanks to its deeper lid! Parrot’s drone Disco FPV really seem difficult to carry as it looks like a big bird, but once you have removed its wings, you can conveniently transport it in travel mode in the Peli 1610 case (Interior: 55.1 x 42.2 x 26.8 cm). The Peli 1630 case (Interior: 70.4 x 53.3 x 39.4 cm) is the perfect protection for the Yuneec’s drone Typhoon even in landing position: just insert the battery and your drone is ready to fly! Many drones can fit in the iM2875 case (Interior: 57.2 x 53.6 x 29 cm). That is especially the case for the DJI Phantom 4, designed for professionals. The cube-shaped case is perfect if you need more depth and space for your drone and its accessories. Some models have handle and 4-wheels offering mobility, the smart choice of protection. They are watertight, crushproof and dustproof and available in different sizes. Just choose your drone model and easily find the ideal size for it! The 0340 case (Interior: 45.7 x 45.7 x 45.7 cm) is the perfect fit for the DJI Mavic Pro drone. This drone is one of the trendiest drone on the market right now as it is small yet very powerful. Although it can fit into a backpack thanks to its small size and pliability, the virtually indestructible 0340 case offers ultimate protective storage space for the drone and all its accessories and extra-batteries, with the added value of peace of mind during its transportation. As for the 0350 case (Interior: 50.8 x 50.8 x 50.8 cm), it fits perfectly the quadcopter Walkera Voyager 4 as well as Yuneec’s Tornado H920. For bigger drones, the 0370 case has the ideal interior dimensions: 61 x 61 x 61 cm, so it can easily contain the DJI Inspire 2 (44 x 30 x 45cm) even in landing position: no need to assembly the drone every time you take it out of its case, just insert the battery and enjoy your flight! market like for military UAVs systems for example. They are easy for one person to move thanks to wheels and handles. As every other Peli cases, the standard features include a dustproof and watertight seal. The most recommended to carry your drones are the 1740 case (Interior: 104.1 x 32.8 x 30.8 cm) and the 1770 case (Interior: 138.6 x 39.6 x 21.9 cm). All the Peli cases can be easily customized with the Pick N Pluck Foam in order to create the perfect fitting size in the exact dimension of your drone and accessories. You can even buy several foams and use the same case for different drones just by changing the customized foam. These products offer Peli’s Legendary Lifetime Guarantee (where applicable by law).